Tomatoes are not a first baby food because of their high acidity content. 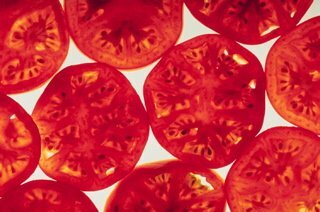 Sometimes tomatoes can cause an uncomfortable rash around the lips. A fresh tomato is an incredibly delicious source of nutrition. Of course, the key to a great tomato is buying it in season, and that is usually from June through September. There are all sorts of varieties of tomatoes now including heirloom and green ones. Look for ones that are exceptionally sweet for baby's consumption. For baby, use cherry tomatoes. These are easy to pack and take to the park. Tomatoes will keep for a week in your fridge. Yes and No. You will not find pure tomatoes in a jar, but you will find pasta and tomato sauce in a jar. No. It is not on the list of the USDA's most contaminated fruits and vegetables. One of the simplest and most elegant ways to serve tomatoes is a caprese salad. This recipe only works with the tastiest and freshest of tomatoes. If you can find heirloom tomatoes, they will usually be pretty expensive, but they taste heavenly. Slice tomato and mozzarella. Tear basil leaves into small pieces. Starting with the tomato, layer mozzarella, basil on top until you have used it all. Drizzle with olive oil and season with salt and pepper.